Judge Approves Detroit's Plan To Exit Bankruptcy : The Two-Way The deal worked out by the city's emergency manager includes shedding $7 billion in debt and borrowing hundreds of millions of dollars to implement the strategy. 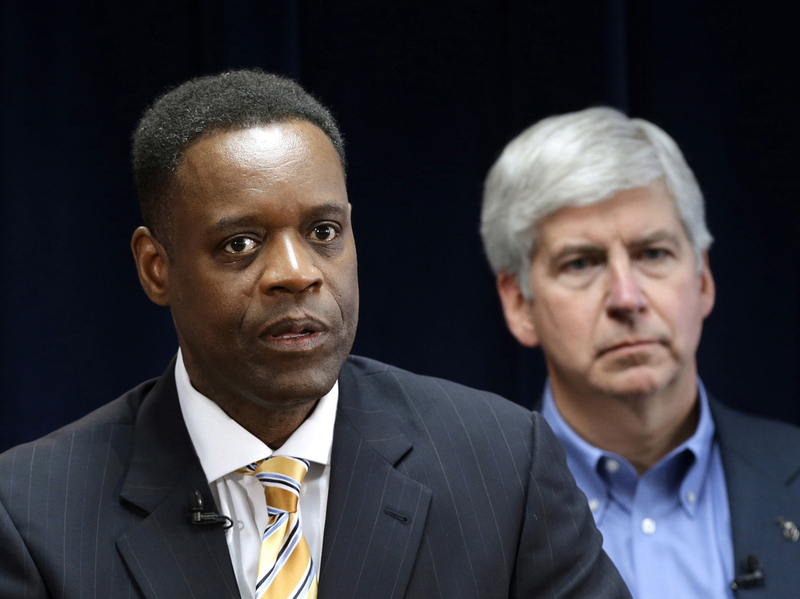 Detroit emergency manager Kevyn Orr (left) speaks at a news conference in Detroit as Michigan Gov. Rick Snyder, who appointed Orr, listens. Orr's plan for the city to emerge from bankruptcy was approved by a federal judge today. As WDET's Quinn Klinefelter reports, the decision by Rhodes came down to whether the plan to emerge from the nation's largest-ever municipal bankruptcy was fair to creditors and feasible for the city. The plan put forward by Detroit's emergency manager, Kevyn Orr, calls for shedding $7 billion in debt, investing more than $1 billion in city services and borrowing hundreds of millions of dollars to implement the overall plan. Detroit has already reached deals with almost all of the creditors that initially opposed the plan, including two bond insurers who agreed to back it in exchange for real estate and a portion of the money they are owed, Quinn reports. Orr's plan also includes money from the state of Michigan, which has joined private foundations in pledging millions to fund the city's pension system. The plan also would keep the city's valuable artworks off the auction block. In his announcement, Rhodes called the settlement with Detroit's pensioners "miraculous," adding that "the pension reductions might cause hardship, but that they were a major cause of the city's financial hardships to begin with." As the Detroit Free Press writes, "The only objectors remaining are more than 600 individuals, as well as business contractors and people who sued the city and won settlements before the bankruptcy." "Kopacz, a senior managing director at Phoenix Management in Boston, also said Detroit was 'at the edge' of its ability to repay $275 million the city plans to borrow to finance its exit from bankruptcy."